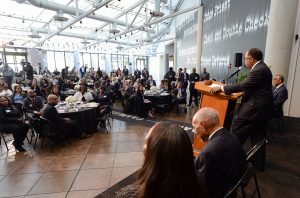 More than 100 county, city, and community leaders gathered today to highlight racial disparities and address systemic racism in public policy affecting Black people experiencing homelessness across Los Angeles County. Black people make up 9% of the population of LA County, but more than one-third of its population experiencing homelessness—an overrepresentation that is consistent demographically across other jurisdictions in the United States. 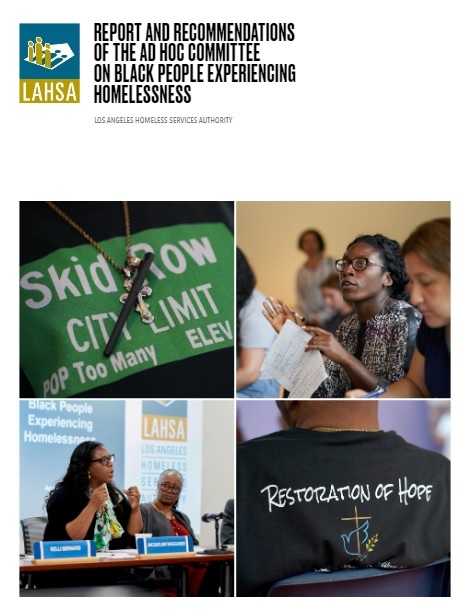 A groundbreaking new report by LAHSA’s Ad Hoc Committee on Black People Experiencing Homelessness sheds light on why, and puts forth a broad set of targeted recommendations to reverse this injustice. 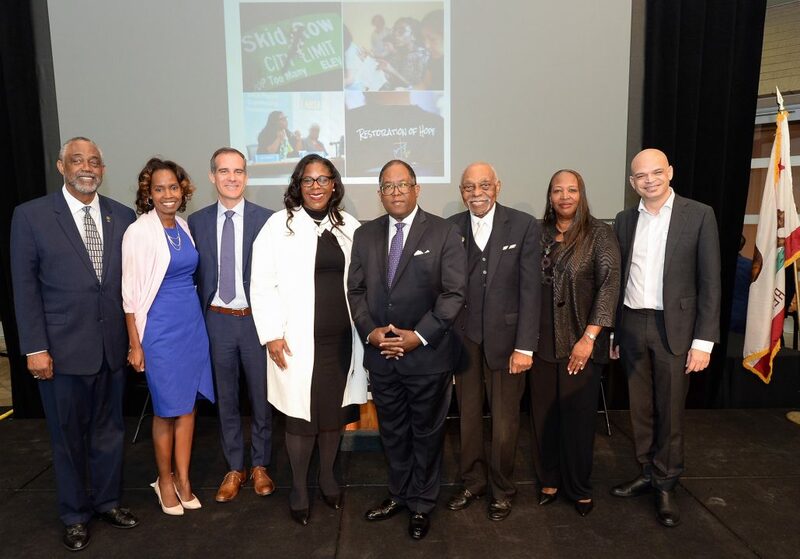 The report, a culmination of nine months of work by the 26-member Ad Hoc Committee, includes 67 recommendations to create a broad framework that will advance equity and eliminate disparities that impact Black people experiencing homelessness across LA County. The report is the first step of a dynamic process of collaboration between stakeholders to implement recommendations, which include interweaving a racial equity lens throughout homelessness policy and service delivery systems as well as across public, private, and philanthropic institutions. A theme that cut across the committee’s work was that racism, discrimination, and unconscious bias in our public systems and institutions has contributed to, and remains intertwined with, homelessness. 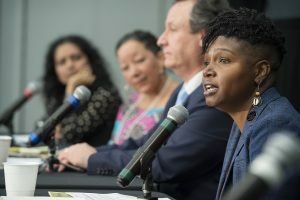 Ending homelessness will require a collective commitment to dismantling racism and addressing racial disparities, and sustained support from funders, policymakers, mainstream systems of care, service providers, and community partners. The report highlights persistent cases of systemic bias in policies affecting housing, employment, criminal justice, and child welfare—and identifies ways to advance racial equity in our homeless services system. For lasting change to occur, institutional barriers across agencies and mainstream systems must be dismantled to eliminate the racial disparities and systemic racism affecting Black people experiencing homelessness. 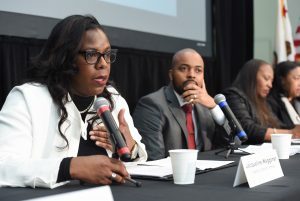 The mounting affordable housing crisis across the state, especially in the Los Angeles region, paired with persistently low, stagnant, and declining wages, exacerbates homelessness and particularly affects Black people. The interconnectedness of incarceration and homelessness creates a revolving door that only serves to make the plight of homelessness more challenging and complex. Black people experiencing homelessness have disproportionately high rates of child welfare system involvement. The inclusion of Black people with lived experience of homelessness in all aspects of program and policy design, implementation, evaluation, and service delivery, is critical to ensuring that programs and services effectively meet the needs of those they are intended to serve. The quality of interim housing varies across facilities, and for some, living in a shelter can be a traumatizing or re-traumatizing experience. Despite local investment to expand the permanent housing resources within the Los Angeles County Coordinated Entry System (CES), a gap in housing availability remains, as the number of participants in need of permanent housing resources greatly exceeds the available supply. This scarcity of resources often results in people living in unsheltered conditions or in interim housing for extended periods of time. Although CES appears to place Black people experiencing homelessness into housing at proportional rates, Black people served through CES permanent housing interventions experienced a higher rate of returns to homelessness than all other race and ethnic groups. This points to a significant need for further research to better understand what is causing this disparity and what additional supports are needed to improve housing stability and retention. Improve data collection, analysis, and collaborative research to better understand and track issues affecting Black people experiencing homelessness. Advance racially equitable policies, programs, and funding across institutions, including LAHSA, homeless service providers, and city and county agencies. Enhance cross-system collaboration and partnerships to more effectively prevent and reduce the time spent in homelessness and improve housing retention and stability for Black people experiencing homelessness. Expand capacity building and training opportunities to ensure service providers understand the impact of institutional racism and racial bias on Black people experiencing homelessness. Target investments and funding enhancements to initiatives aimed at reducing disparities and ensuring sufficient funding for services and programs supporting Black people experiencing homelessness. Implement targeted improvements to service delivery within the Los Angeles County CES and other systems of care in which Black people experiencing homelessness are overrepresented, to address barriers and improve outcomes for Black people. Expand advocacy at federal, state, and local government levels for progressive and racially equitable policies, programs, and (direct or indirect) funding impacting Black people experiencing homelessness. 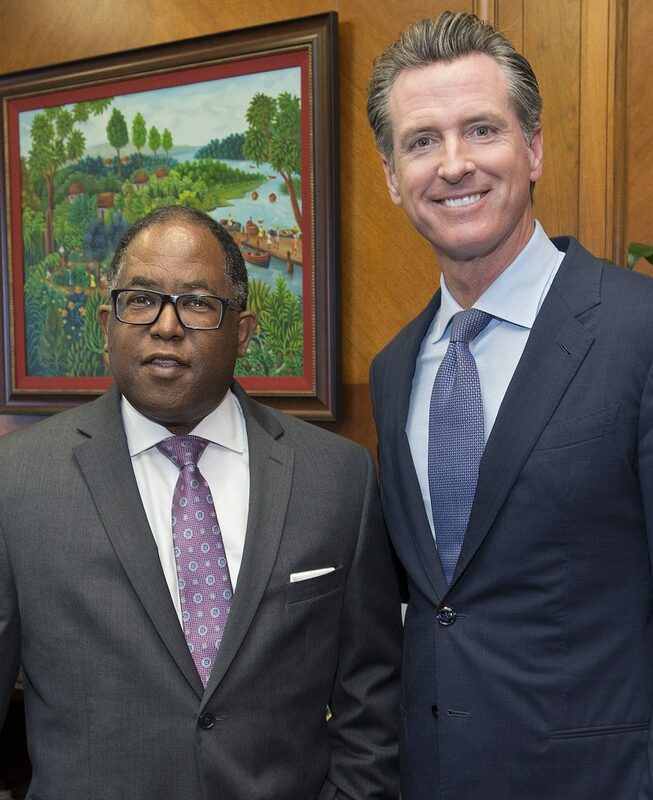 “I applaud Governor Gavin Newsom for creating the Commission on Homelessness and Affordable Housing and enabling the State of California to have a larger role in tackling the defining civic and moral crises of our time. “Los Angeles County is the epicenter of these crises, accounting for about 40 percent of the state’s homeless population. Almost exactly two years ago, we took the unprecedented step of declaring a state of emergency and placing Measure H on the ballot. This initiative has now taken tens of thousands of people off the streets and into housing, and prevented many more of our neighbors from falling into homelessness. The Los Angeles County Chief Executive Office/Homeless Initiative and the Chief Information Office have launched a new initiative to enlist the technology industry in the Countywide effort to prevent and combat homelessness. In a bold move to harness the resources and expertise of tech companies and foster more strategic investment in the sector, L.A. County issued a call for solutions with the potential to creatively accelerate outcomes for people experiencing homelessness. 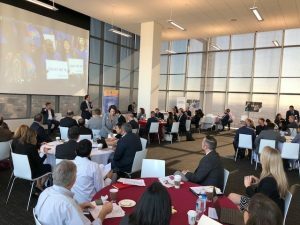 A broad industry representation, including large data and tech companies, civic tech, start-ups, digital services, virtual reality firms and academia, have already signaled their strong interest in partnering on this critical effort, with upwards of 150 participants convened at a recent County-hosted technology innovation forum on homelessness. The Countywide movement is seeking diverse partners and new approaches to deliver what’s working more effectively and to foster inspired thinking and sustainable solutions around housing, data, customer empowerment and operational effectiveness. Submissions are due mid-November. 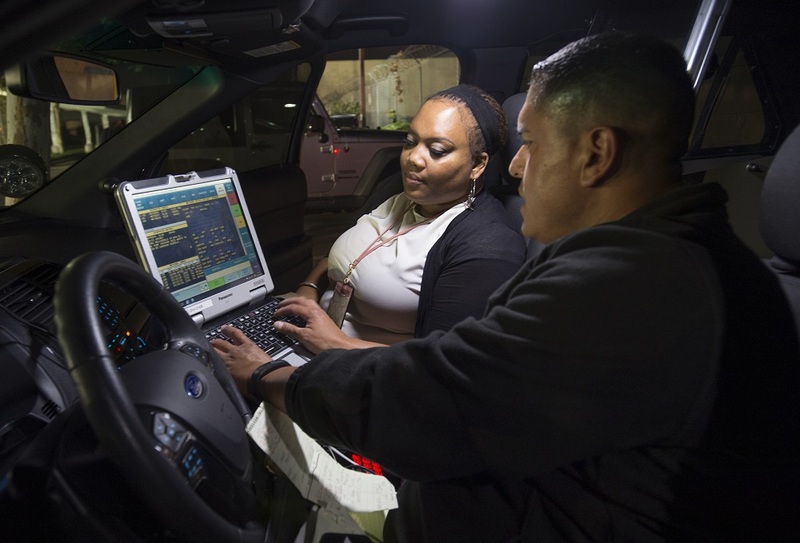 “The Homeless Innovation Technology Initiative marries tech talent with the real challenges surrounding homelessness in L.A. County. The tech community is coming together to create tangible innovative solutions,” said Bill Kehoe, Los Angeles County Chief Information Officer. The Board of Supervisors is making it easier for homeowners to build or convert existing spaces into Accessory Dwelling Units (ADUs), also known as “backyard houses” or “granny flats.” The goal: to help increase the region’s seriously depleted housing stock though the development of safe and livable low-cost housing options. He recently hosted workshops at the Exposition Park Constituent Service and Training Center for homeowners curious about building, fixing up or legalizing a rental on their property. Click on the links below to learn more. Rent control in the City of Los Angeles. Seeking to catalyze the community of architects, designers, planners and creative strategists to re-imagine the potential of ADUs, the County’s Art Commission launched Part of the Solution: Yes to ADU in partnership with the County’s Homeless Initiative, Department of Regional Planning and Community, and Development Commission. 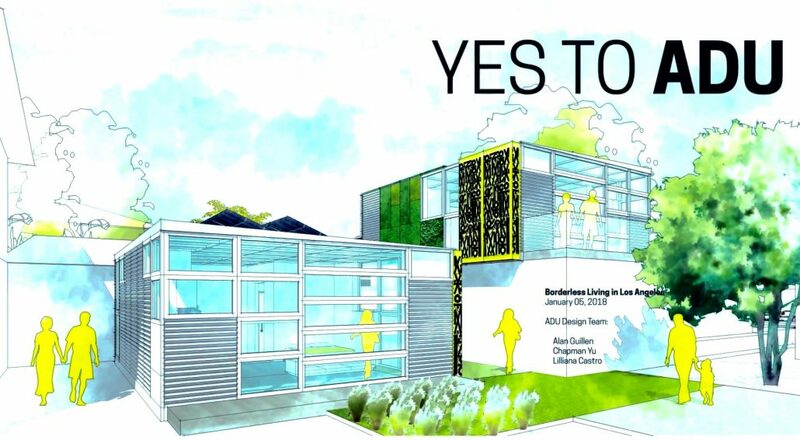 In January 2018, it announced the winners of an ADU design competition. Participants included ranged from students to established practitioners, who assembled a tangible index of possibilities that can help policymakers, architects and homeowners implement ADUs in their communities. 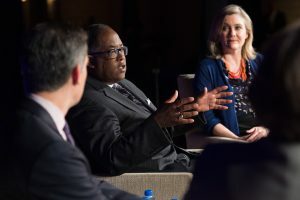 More than 1,000 people gathered at the nation’s only summit on supportive housing and heard Supervisor Mark Ridley-Thomas and Mayor Eric Garcetti talk about Los Angeles’ passage of ballot initiatives that will collectively raise an unprecedented $5 billion over a decade to address homelessness. Since voters approved Measure H and Proposition HHH in late 2016 and early 2017, Los Angeles has become an epicenter of supportive housing activity. This prompted the Corporation for Supportive Housing to select Los Angeles as the host of its 2018 summit, which drew attendees from across the US, as well as Canada and New Zealand. The summit included several interactive sessions designed to encourage dialogue and an exchange of ideas. 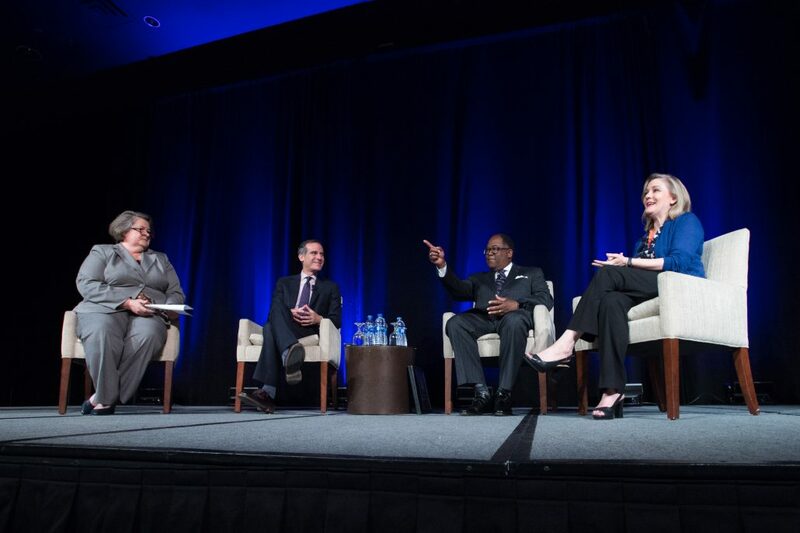 During the plenary session, Supervisor Ridley-Thomas, Mayor Garcetti, and United Way CEO Elise Buik participated in a panel entitled Leveraging Local Political Will to Create Supportive Housing. Supervisor Ridley-Thomas championed Measure H, a quarter-cent Los Angeles County sales tax that seeks to end homelessness for 45,000 people in the first five years, and prevent homelessness for another 30,000 people. Mayor Garcetti championed Proposition HHH, a Los Angeles City bond measure that will finance the construction of 8,00 to 10,000 supportive housing units for the chronically homeless. United Way played a crucial role in the campaign to pass both ballot initiatives. According to the 2018 Homeless Count, the number of people experiencing homelessness in Los Angeles County has fallen for the first time in four years to 53,195 — a three percent decline.